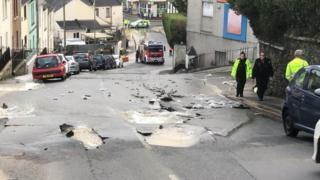 A road has collapsed after a burst water main caused heavy flooding in part of Plymouth. The burst, in the Melville Road area of the city, has seen the streets closed between Alexandra and Cambridge roads near the Ford Primary School. A "significant" amount of water was running downhill, Devon and Cornwall Police said. South West Water said it was "hoping to restore water supplies as soon as possible".